EasyPay Finance | Bayard Business Capital and Consulting Inc.
Bayard Business Capital and Consulting is a strategic partner with EasyPay the premier provider of auto repair financing. EasyPay Finance offers payment options for customers with good to no credit. Founded in 2001, EasyPay has helped hundreds of thousands of customers get back on the road and provided hundreds of millions of additional revenue dollars to shop owners all across the country. A customer ‘s car limps into your shop. It’d take a miracle to drive it another mile. They’ve got work tomorrow, kids to pick up from school – they really need their car fixed. You want to help them, not to mention you want the revenue, but they don’t have the cash to cover the repairs. Sound familiar? You’re both stuck. That’s where EasyPay steps in to help. According to AAA, 1 in 3 U.S. drivers cannot pay for an unexpected car repair bill. So, what happens when your customer can’t afford their repairs? You lose a sale and your customer has to suffer without their car. EasyPay solves that problem by offering transparent payment options for up to $5,000 with $0 down for customers with good credit to no credit. 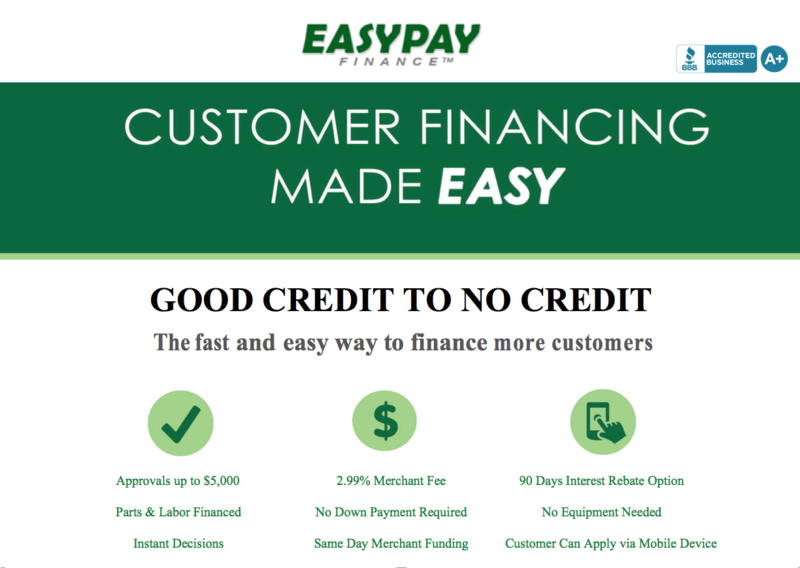 EasyPay typically approves 40%-80% of applicants, depending on whether the customer is run through a primary credit option. Since every customer has the option of paying their balance off within 90 days to receive a full interest rebate (minus a $40 processing fee), your staff will feel comfortable discussing the program. You can help more customers get on the road, increase your revenue and ARO. In fact, many shop owners using EasyPay see increased revenue of up to 30%. How Much Does It Cost to Use EasyPay? It’s free for shop owners to enroll, and the only cost is a small per transaction fee of 2.99%, generally less than your credit card processing cost. For more information, call Bayard Business Capital and Consulting @ (314) 312 4603, or click to enroll for free online. Cary White is a Bayard Business Capital and Consulting Senior Vice President and Partner. He has an extensive career in real estate and commercial lending. Cary is the Auto Repair Industry Market Manager. Cary resides in the Joplin Missouri area. Christine Nessle started her career as teacher and director of youth services in Christian based schools. Her skills MS Windows and credit card processing, problem solving, and great communications skills. Christine resides in Ohio. Daryl Leine has over 15 year experience as a community banker. In addition, his ownership of Collectable Auto and family experience in the auto repair industry has been his long-term interest. Daryl resides in the greater St. Louis Missouri area. Dan Connor after a tour of duty in Vietnam was honorably discharged from the US Army. A business career of real estate sales and building homes. Then selling Hotel Directors in ten states. Dan resides in Southwest Missouri. John Horton has been in the insurance field for 17 years as an inspector, supervisor, and operations manager. John enjoys taking vacations, sports, fishing, and paranormal investigations around the country in his spear time. John currently resides in Kentucky with his 2 pug dogs. Jim Mosquera is a Principal at Sentinel Consulting, a boutique alternative finance and restructuring firm. He operates The Sentinel, a publishing concern supporting his writing and speaking activities. An author of six books and four audio productions, he’s a sought-after interviewee in the areas of financial markets and the economy. 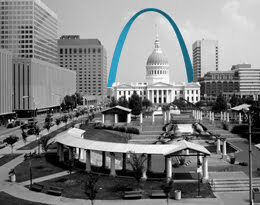 Jim resides in the greater St. Louis area. Mrs. Shelly Smith has been involved in the insurance industry since 2014. Shelly served in the U.S. Army for 4 years with several deployments under her belt. Mrs. Smith has worked with underwriters from several big insurance firms and her “go-get-’em” attitude has helped her quickly and efficiently persevere in the insurance inspection field. In her spare time, she advocates for veterans assisting them through the Department of Veteran’s Affairs claims adjudication process where she helped veterans retrieve $73 Million dollars in benefits in under 3 years. Shelly resides in central Kansas. Bayard Business Capital and Consulting is a premium provider of optimal commercial financing solutions and business consulting. We are dedicated to providing financing solutions to build, grow and allow businesses the opportunity to thrive.